Positive Label Program increases participant awareness of the power of words (labels). Words can hurt and they can also help. It's up to us. Program completely reframes any name-calling and negativity challenge to focus on the solution. And it works. Accentuate the positive in all of us. 2. Build new habits with 4 weeks of positive actions. In Middle School program has a subject area host. Mrs. Young's 7th graders brought the story to life for everyone. 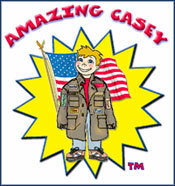 Casey stories provide foundational language. "Sticks and stone may break your bones. But calling-names and put downs. They can really hurt a person." Isaiah, 7th grade. Student's patriotic poetry & artwork decorates the walls. Third graders improved math scores and focused on "smart" & "brave." Door displays focus on student's positive qualities. This is a prize-winning effort. Older students personalize the Casey positive shirt activity. Their shirts often become positive self portraits or the basis for paragraph and report writing. Every adult and student makes their own Casey Positive Label shirt. Each shirt is proudly hung in the hallways and sometimes they also decorate bus ceilings. Middle School door setting the tone for everyone entering this class. Each student has their own ticket to board this "Positive Express." The wall leading up to this door has an entire paper train. The Positive Express is quickly becoming a school landmark. To reach the media center, "Turn left at the Positive Express." Door and wall displays provide opportunity for teachers and students to work as a creative positively focused team. The message of this door display eccourages everyone who walks by! Sunshine Board is a posting place where students thank others for kindness shown to them. Subject doors include the positive qualities that help students succeed in class. And often showcase people who've made a positive impact in their discipline (e.g. Einstein, George Washington Carver). Ms. Sneyd's middle school mathematicians used the Casey checks and deposits activity to establish and run their own economic system. Program includes everyone on the school team. This cafeteria door focuses on the words of positive nutritious eating and even includes needle-point vegetables. Brooks students proudly wore personal positive t-shirts on their school's celebration day. As part of their Celebration Day, Liberty Point recognized their "Outstanding Positive Student of Character." Jasmine won a bicycle. Left: Counselor, Bille Anderson receives the Kamaron Outstanding "Service & Innovation Award. Braelinn Elementary is the first school in the nation to earn its program re-certification. This Whitewater Middle School Teaching team came to celebration dressed in their own Casey shirts. Phil Hulst, GA Department of Education and Jason Wetzel, National Museum of Patriotism and program creator, Margaret Ross, were all on hand for the celebration. School banners are often part of the celebration day. Schools who successfully meet program requirements are awarded plague for their trophy case. These King Springs students proudly displaying Positive Labels.